Artist Alina Gallo spent over a week painting a life-sized egg tempera mural directly onto the walls of the entire Real Room. The work re-creates Keleti Station, a train station in Budapest, Hungary where thousands of refugees (many from Syria and Afghanistan) were stranded on their way to Germany, Sweden, and other European destinations during the summer and fall of 2015. 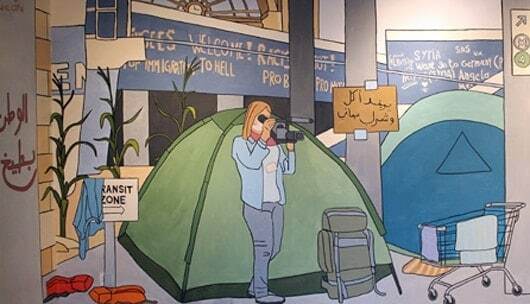 Using imagery sourced from traditional and social media, anti- and pro-migrant graffiti, and disparate first-hand accounts, Gallo has created a composite graphic rendering of Keleti Station. Gallo creates large-scale murals using tempera, an ancient technique for creating fast-drying, long-lasting paintings from pigment mixed with a binding medium (usually egg yolks). Examples of tempera painting still in existence date back to the 1st century AD, and it was the primary method of painting until the invention of oil paints in the early 1500s. Click below to view an exhibit booklet with more background on the mural and detailed descriptions of each section’s imagery. Alina Gallo, originally from Long Island, New York, is based in Rome, Italy. Her large site-specific installations and contemporary miniature paintings have chronicled the representation of events in the Middle East and North Africa since the onset of the Arab Spring. Alina’s work samples and combines imagery and information from a multitude of raw footage, photographs, and documentary snippets, as well as network media sources, reflecting both a fragmented understanding of these accounts and the conscious and unconscious attempts to recompose a potential reality.